Doing a t-shirt takeover is cool, but how do you take it to the next level? Basic takeovers are usually one color with a minute design on the front. That’s unacceptable to us. We chose to create and produce vibrant, fully-covered elephant printed t-shirts designed specifically for each Jordan sponsored university participating in Midnight Madness. 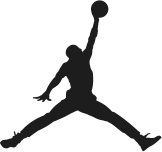 The Jordan Brand is one of the most recognizable icons in the world. Creating a design for the company should represent what the Jordan brand is. We wanted to show simplicity with strong design that represents the school and the brand in a positive way. This way, people would enjoy wearing it on any occasion. Lead with design: Plain t-shirt takeover are usually a graphic on the front and one color. We chose to unify the canvas as a whole with an all over Jordan specific print tailored to the colors of the respective sponsored schools. The visual and tangible energy was like none other. Not only did the schools warm-up in the shirts but also delivered strong wins each respective night. Social media, blogs, and local papers praised the concept of the shirts and some even ended up on eBay for outlandish prices. Through this, we ensured that future t-shirt takeovers would never be the same.